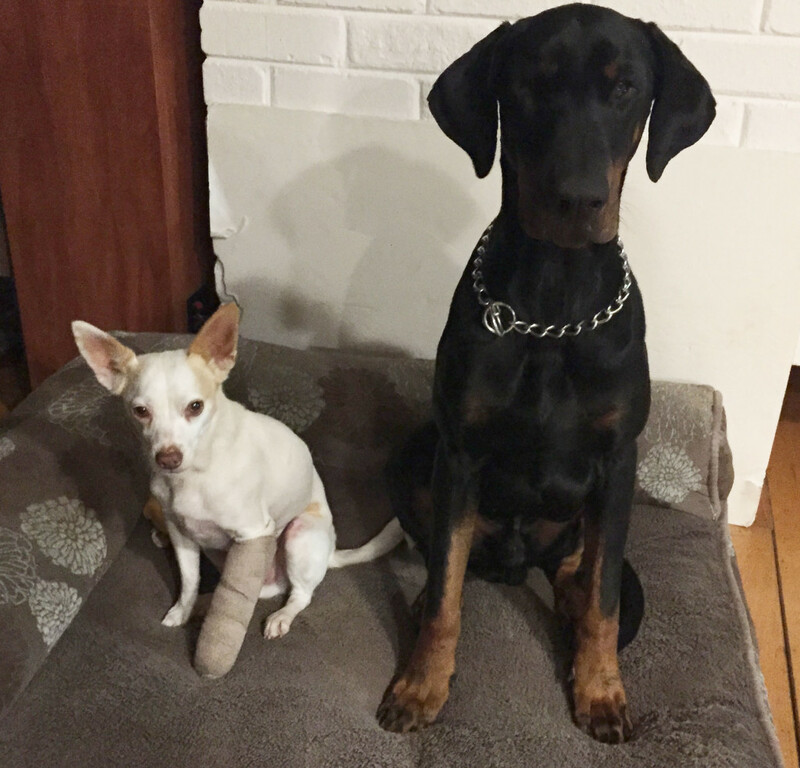 An expensive visit to an emergency vet clinic concluded on a fractured toe. My options were to leave the leg as it is or to put a splint on. I opted in for splint because it would protect an injured leg, reducing the pain. 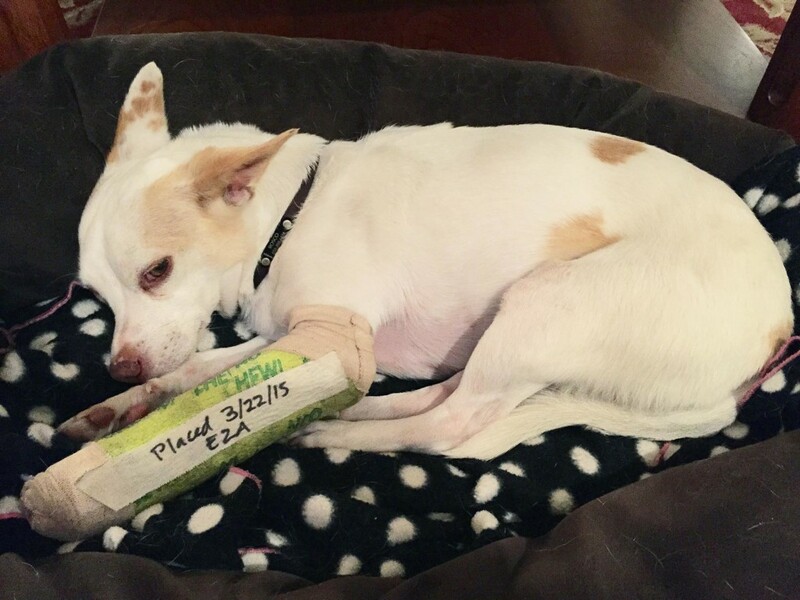 I’m not in favor of painkillers for dogs – they just numb the problem area and you can’t make a reliable judgement if the dog is getting better or it’s just the meds. Given that my poor Rosco had a broken toe for a few days by then, I didn’t fill a prescription for painkillers. The vet applied a splint and told me to come back once a week for at least 6 weeks to replace it. Each replacement is about $80. So I’ve decided to figure out how to change the splint myself and I’m glad I did it every 3-4 days and didn’t wait a week as I was told. Self-adhesive wrap they applied over the gauze, was touching Rosco’s skin in a few places around the elbow and underarm. In three days, when I was removing the splint – the skin in those few places was almost melted with the self-adhesive wrap. No matter what I used – adhesive removal, soapy water – the wrap came out pulling the skin off. Poor Rosco was in awful pain. Watch my video on how to change spoon splint for dogs. it takes at least 6 weeks for toes to heal. Even longer for a leg. If your dog is an athlete and it is crucial to have the bone heal properly – repeat an X-ray in a week or so after the initial splint. If you wait any longer – the bone will start healing. If it doesn’t grow together properly – you might have to break it again or do the surgery. In my case – I did my best with the splint and didn’t do any follow-up X-rays or visits to the vet. Rosco was wearing the splint for 6 weeks and after that his toes seemed perfectly fine. He is chasing after squirrels and cats like nothing had happen.